One of my favorites is this meal. I must admit there was a time when at the end of the month we ate this quite often, as it is relatively cheap, but we never got tired of it because we love it. Fortunately my husband shares my enthusiasm about this food. It has been a long time, though, since I made it the last time. I was planning to do so, but it is rather hard to find fresh pork heels. Now I finally bought some beautiful pork heels and it became our Sunday meal. 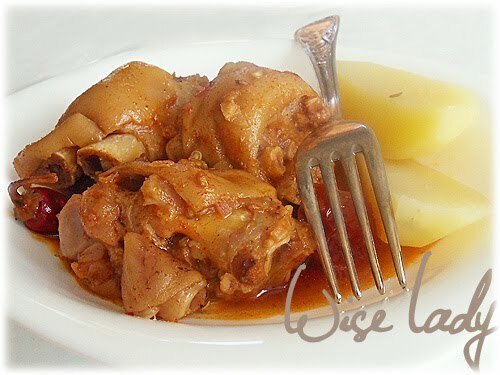 Our kid ate the boiled potatoes with something else because he does not like pork heel stew. Yet. I suggest you try allspice in this as it adds a small and harmonic taste. Use only one piece though, not more. In the store, I let the butcher cut the heels in 3-4 pieces.I wash the meat at home and put it in a pot under water that just covers it. I heat it until it boils, then I put the top on the pot, reduce heat and let it cook for an hour. When there is time, I let it stand then in the fridge for a night. This way, the fat comes up to the top and gets firm, thus I can remove it. If there is no time for that, I just remove it with a spoon while cooking. I gather the fat in another (big) pot and heat it. I cut the onions and garlic into small pieces and cook them in the hot fat for a while. When they turn a little transparent I add the heels together with their liquid. I add pepper, allspice, chili, tomato, green pepper and salt. I cover the pot again and cook for another 15 minutes. I add water only if there is an emergency : one should not let the stew be too thin. If the 15 minutes are over, I add paprika and let the stew boil for another 15 minutes. I serve this with boiled potatoes flavored with cumin and pickles. Thanks for the recipe. Where I currently live its a little hard to get my hands on any cut of pork but I did manage to find a supermarket that sells pork. But only pork heel. Have not used this cut before but will be trying it for the first time with your recipe.